10 Best Frugal Living Tips. Save Money Like A Pro. About 18 years ago, Hubs and I hit on hard times. Few people know this about us actually. We were building our dream home out in the country. We found this quaint little town that we fell in love with. It had a small school for our boys and a slow way of life we were looking for. We lived in a small apartment while we built so Hubs could work on the house after his job and have a shorter commute. The house got a little bigger as we went along, but that is how it happens sometimes. We were buying new furniture, new appliances, new bedroom outfits, new dishes..new new new. We used our credit cards to buy knowing we would pay them off when we were done. Hubs had a good job after all so we were set. Our youngest was born in January and we moved into our new home in April. We loved our new home and our new rural town. Our boys were just starting class at a quaint little school and were making friends. Then Hubs was laid off……in July. Yep, you read that right. 3 months later our lives completely changed. Just like that our income was cut in half. If that doesn’t stop you in your tracks, then nothing will. We were not prepared. No savings. No backup plan. Nothing. Oh, wait, we did have something. Remember all that credit card debt? Yep, we had that. We had to figure out what to do and quick so we didn’t loose the house. As we dipped our toes into those frugal waters, we realized something. Frugal living was the answer we needed. We would not only learn how to survive on half our income, but thrive on it. Our goal was simple really, how to live our life spending as little money as possible. We needed to pay our bills and pay down our debt on half the salary we were used to. It took work and it took patience. Some things we tried were huge successes and others set us back even further. Eventually we found our stride and made it through those first “iffy” months. Today we still live a life of frugality. Because even as we recovered financially we realized frugal living was the way to keep our finances in check. Had we lived this way prior to Hub’s layoff we would have had a backup plan. Something to live on as we caught our breath and got our footing. Trying to make the money last is a dance you develop over time. Along the way I have learned some great money saving tips. Old school tips that saved us (and are still saving us) oodles of money. My Best Frugal Living Tips. Tip #1 Stay out of the stores. This is the best and easiest way to save money. I have so many friends that shop for fun. Shopping is not a hobby people! Shopping is a chore. Something on your to-do list. Remember that and this one tip alone will save you hundreds. Tip #2 Use cash. Keep those credit cards tucked away and put cash in your wallet. 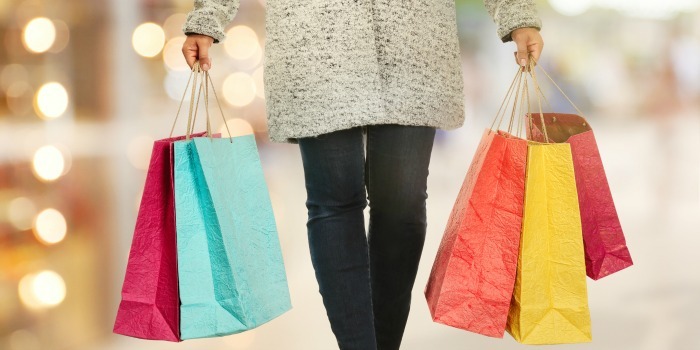 Knowing exactly what you have to spend when you are in a store will keep you from making impulse purchases. Trust me those impulse purchases can kill a monthly budget in seconds. Avoid them at all costs. Running errands with cash will take care of that temptation for sure. Tip #3 Make it don’t buy it. I love this tip and it is one we live by even today. Cooking from scratch is a lost art and many young people believe a time waster. I disagree. Making bread takes just 20 hands on minutes. The rest of the time is spent rising, resting and baking. And what tastes better than homemade bread? Nothing if you ask me. But don’t stop there! Make cookies and other sweet treats rather than buy. With Facebook and Pinterest you can find copycat recipes all over for just about anything. Frugal Ninja tip: Plan a morning each week for baking and stock up your pantry in just a few short hours. Double batches for your freezer and save even more time and money. Tip#4 Fix it don’t replace it. Don’t think just because a big ticket item stops working you need to replace it. In a world of YouTube and DIY videos you can literally fix anything today. Last week my double oven bit the dust. Rather than shell out a thousand dollars for a new one, Hubs got on YouTube and taught himself how to remove the control board. We then found a place online that would fix the board for $148. For a little time and effort on our end we saved $900. Tip#5 Sweat labor is always cheaper than convenience. If you are capable always do it yourself. Save convenience for times when you just can’t pull it off. In our home electricity is one of our biggest utility expenses, so we are constantly finding ways to do without. For example, we always ALWAYS, hang our clothes to dry. On the porch, on the clothes line out back, in the basement. Where ever I have room. The dryer is for towels only. Once we started doing this our electricity bill dropped dramatically. 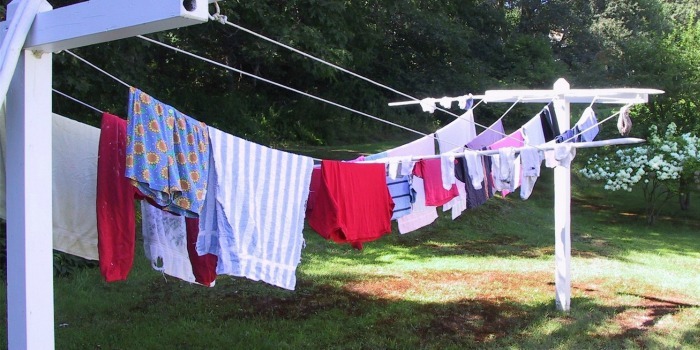 No room for a clothesline? No problem. I have several of these drying racks that will easily dry a load of clothes and can be put anywhere. Tip #6 Stay out of the mall people!! I visit our mall maybe once a year on Black Friday. Other than that I avoid it like the plague. Like I said before shopping is not a hobby. Get yourself into that mindset and you open up a world of possibilities. 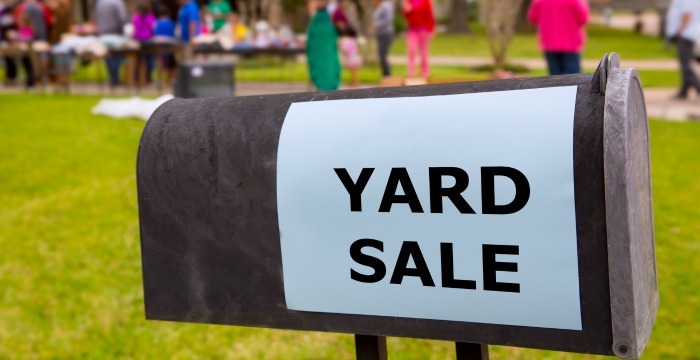 Yard sales, thrift stores, consignment, garage sales, Facebook, Craigslist, swaps I could go on and on. For years these were my go to shopping options, real honest to goodness stores were rarely if ever on my radar. If you have to make it a game. See how little you can spend on a needed item. No, I’m not kidding! I lived this way for years (and still do) It’s all about your mindset, get in the right one and you will surprise yourself with how much you can save. Tip #7 Borrow (or share) rather than buy. This is a tip I love to use. Before you buy anything big, see if you can borrow one first. I can’t tell you how many times this little tip has saved me an unnecessary purchase. Since Hubs and I heat our home with wood we spend quite a bit of time cutting and splitting logs for the winter. Rather than purchase a wood splitter of our own, we are able to borrow our neighbors. In exchange we make sure it is oiled and in good working order at all times. If it breaks down for any reason either with us or with them, we make sure it is fixed. This exchange gives them a working tool at all times and saves us from a hefty investment. Tip #8 Decide what is a necessity and what is a luxury. This should always be a question you ask yourself before you purchase anything. Let’s talk about bread machines for a minute. I know there are those of you that swear by them, but not me. I used one for a while but I found it wasn’t really the time saver I thought it would be. Now if you work outside of the home, I get it. Having a bread machine especially if you are using that timer feature is a game changer. But for me it just wasn’t. I can make a loaf of bread in 20 minutes. Of course that does not count the rise/rest/bake time but I am not needed for that. I am able to do other things while my bread is at work. So, for me, a bread machine was not a necessity it was a luxury. Base every single purchase you make on needs over wants. If you need it, get it. If you want it, it can wait. Tip #9 Rethink gift giving. I cannot tell you how many Christmas’s we went into debt to give people gifts. And the crazy part was it took until next Christmas to pay that bill off! What finally did it for me was the year we exchanged names with our family. I gave a gift card to the person who’s name I picked and guess what they got me? Yep….a gift card! Now, ignore the fact that we both requested those gift cards. But to spend money in such a generic way really bothered me. Learning to think outside of the box is not only thoughtfulness at it’s best but it can save you money as well. Don’t panic kids. You do not have to be Martha Stewart to give a homemade gift, there are some really great ideas that do not require a lick of talent. One year we gave my Mother-in-law a coupon book for dinner at our house every month for a year. She loved getting to see her grandchildren each month and we loved having her company. It was a great gift that cost us nothing and brought joy to everyone involved. If you want more no cost and fun gift ideas, check out my post Unique Gifts For The Hard To Buy For. Not all are free, but quite a few of them are. Tip #10 Never fall victim to blind spending. 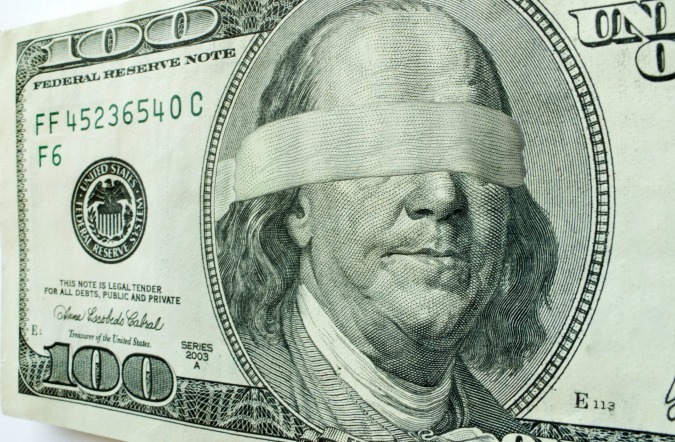 Blind spending is what I call any purchase made with a credit card. So many times when Hubs and I needed something we would use that card to pay. Oh, we were earning points or cash back we would say as we silently promised to pay it off when the bill came. Well, guess what? The bill (oiy, dare I say bills) came and went and before we knew it we were in a mess. Make sure every single purchase you make in a conscious one. Know the money you are spending the second you spend it. If you do not have the cash, it can wait. Short of a medical emergency I promise you will not keel over if you postpone this purchase a few weeks or even months. Take this advice from someone who has been there. Pay in cash so it is yours to own. If you pay with a credit card you are renting that item, sometimes paying for it longer than you own it. I’ll just let that thought sink in for a minute. Pay in cash so you own in now. So there you have it my frugal friends. My top 10 frugal living tips for saving money the old fashioned way. I hope you are able to use this list as a jumping off point. Now, go and embrace your inner frugalness (oh, yes I did just make that word up!) and live a life of abundance. 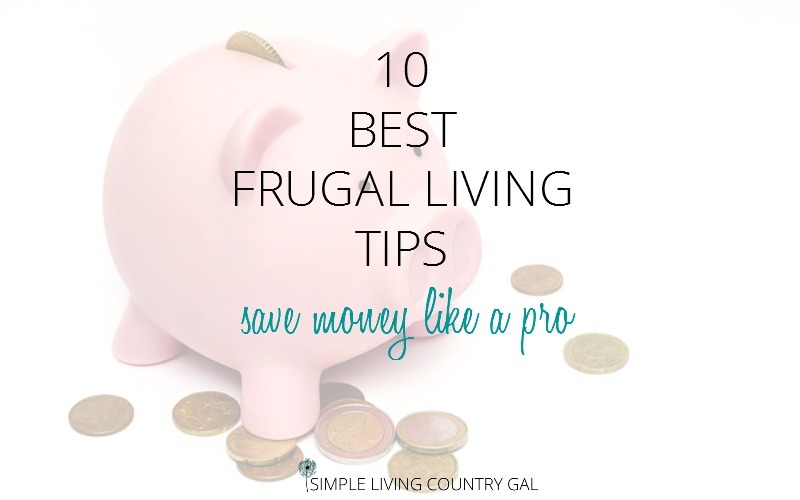 10 Best Frugal Living Tips was featured at the Simple Homestead Blog Hop! !